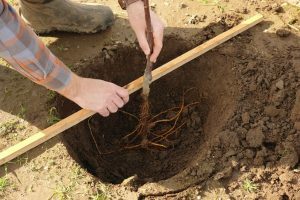 Short days of winter are the optimum time for bare-root plantings. Many varieties of trees and flowers are available at garden and other stores for your selection. Fruit trees, roses, grapes, and berries are available at nurseries and stores at this of the year. The selection of plants is best at this time of the year more than any other time. They come in many forms. Some may be in loose soil and others may not have any soil at all. If you are looking for fruit trees, winter is the best time to find them in bare root form. Apple, apricots, peaches, plums and many others are available at this time of the year. They come in dwarf, semi-dwarf and standard size trees. Be aware of growing heights and coverage of each tree when you plant them. Also important is orientation to the sunlight. Many trees need full exposure to sun and may grow tall and wide. Bare roots are easier to plant. Dig a hole large enough to plant the tree and spread roots over some loose soil. Before filling the hole add some organic material and bone meal. You do not have to add fertilizer until the spring.